Jan Folkson grew up in New York City. With a passion for music, he taught himself to play keyboards and program synthesizers. As a teenager he played with a local band for several years at many of New York's best known clubs. After a brief stint in music retail, Jan gained the connections needed to advance his career to the next level. Jan has had the opportunity to work with some of music's greatest artists, musicians and engineers, as well as notable producers such as Phil Ramone, Nile Rodgers, Joel Moss, Rob Mathes and Peter Asher. Always pushing forward, Jan attended New York's Juilliard School where he studied composition and music theory with Stanley Wolfe and Kendall Briggs. 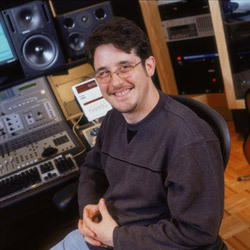 As an experienced recording engineer and digital audio editor, he has lent his expertise to many of New York's largest recording studios and is part of the active beta test group for Pro Tools® as well as several plug-in manufacturers. Jan currently lives in Long Island, NY with his wife, little girl, big dogs, lots of guitars, several Volkswagens and a love of great music and a passion for creating it.